Parts, Lugs, Wraps, Discount Heads...make your own sale. Hurry, this offer is only available through end of October. "Got my hands on the shells,they're KILLER! I have a buddy who is going to take some professional pics of the kit." 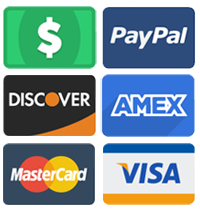 For 20 years, DrumMaker.com has been THE COMPLETE SOURCE for custom drum builders & drum repair shops around the globe, with KNOWLEDGEABLE, FRIENDLY SERVICE, FAST SHIPPING and the MOST COMPLETE SELECTION of custom drum parts for your DIY projects. We stock lugs, hardware, shells, drum finishes, custom bags and more. 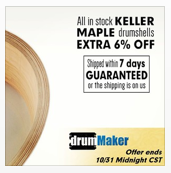 Whether you need a single lug or a huge stack of drumheads, we have it! ...and at the BEST PRICES anywhere. 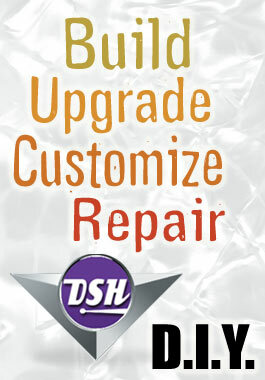 DSH also offers CUSTOM SERVICES like shell wrapping, cutting bearing edges, layout / drilling and skilled vintage restoration. "I needed a HUGE kick drum cut down. @DrumMaker chopped it in a 4 DAY turnaround. Beautiful work. Thanks Andy! pic.twitter.com/oXoiDS4MJo"